The weather could not get any better here in Buffalo, and we Western New Yorkers are taking full advantage of the near 80 degree temps we are having this first weekend of Fall. Beautiful Fall day on the Erie Canal. As my three year-old takes her afternoon nap, I thought I would take the opportunity to get some work done. I put away my garden decorations that I had out, and also started writing this post. As a mother in her thirties (and that’s still hard for me to swallow– when did I get old!? ), I have to prioritize EVERYTHING in order to make sure things get done. Including, my gardening. I know most people my age with kids couldn’t fathom spending much more time in their backyards than simply mowing their yards. I get it. Really. So when my daughter finally starts school, I will again have to prioritize my gardening duties based on the activities she chooses to take part in. That’s ok– that’s what it is all about. No matter what you have going on in your busy life, you can achieve gardening greatness one step at a time. So, how do you exactly maintain your home landscape with a toddler? Well, like parenthood, the answer is not simple. With the right amount of prioritizing and support, it is possible. Newborn — Infants are a lot of work and a lot of time. So, don’t worry about elaborate flower beds at this stage. The most you should worry about at this point is purchasing some annuals and planting them in small flower beds while your little one naps. Or, have a family member or friend watch your little one while you get a most needed break and some “me” time in your flower beds. All you have to do is water and weed a little. One year old/two year old — At this point, you aren’t as tired out as you were when they were newborns, but your time is still just as valuable now as it was then. You will have a little more freedom now that they are walking around and like to be outside (hopefully), but you still really can’t concentrate on doing anything because you are worried your toddler is going to get into things that he/she shouldn’t be. You will still be relying heavily on nap times and have someone such as your spouse/partner to look after your toddler while you start really doing what you want to do in your yard. Three year old — it is definitely much easier to do things at this stage. 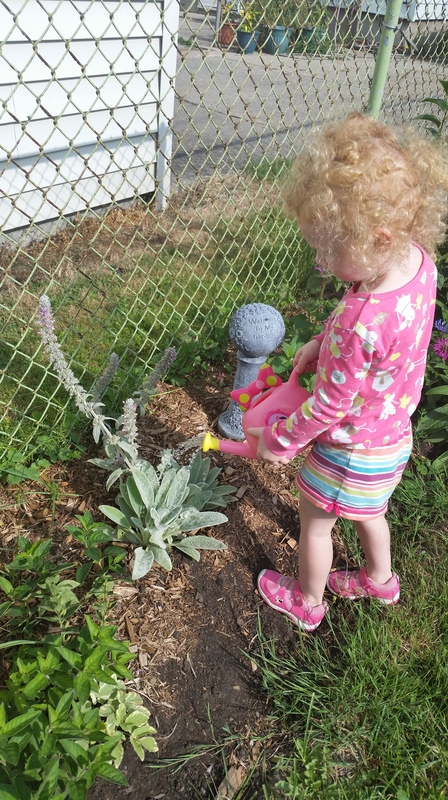 As they quickly grow out of that “toddler” stage, you can start really getting into your gardening. At this point, I have included my daughter into my gardening world, pointing out flowers, telling her the names of various plants. She even “helps” me dig by using my trowel, and waters flowers by using the little Minnie Mouse watering can I purchased for her. It’s a great time to bond with your child and get them to appreciate nature and all its beauty. My daughter helping me water my lamb’s ears. So yes, it is a challenge, but is not impossible to maintain and grow your home gardens with a little one. Once you find a routine that works for you, things will fall into place, one little “toddling” step at a time. Yet another week has passed, and we have been fortunate enough to have some nice warm, yet windy weather here in Buffalo the last few days. 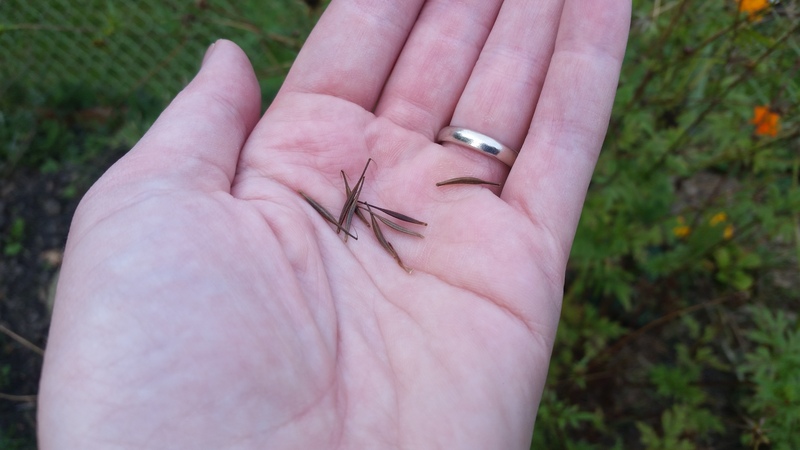 I have been concentrating on a couple of projects in regards to my gardens this week, and one of them is the one I will be talking about in this post– harvesting the seeds from plants that I have in my garden. I am still waiting for my sunflowers to mature and dry out, but that will be a whole other post coming up soon. I have also been working on a fall decoration project that has something to do with one of my favorite plants to work with this time of year– the cattail. Since I love doing things outdoors, you will notice that I like to blend my love of outdoor adventure with my gardening endeavors (my toddler daughter will make her cameo as well)! Stay tuned for some pretty interesting stories! Yes, that’s my little kitty’s paw on the far right. He’s very nosy! Now, time to get back on the subject of seeds. And bulbs. And everything that makes this time of year very important for the beginner/frugal gardener. I am harvesting my seeds because I would like to give them out to friends and family as Christmas gifts this year. But also, I am harvesting some of my annual seeds so I don’t have to purchase them next year! 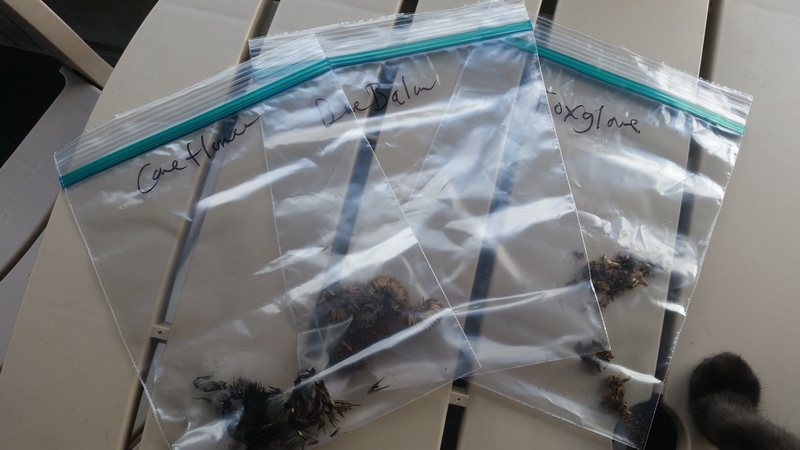 This past week, after I got home from work, I spent some time in my backyard pulling the dried out seeds from some of my favorite plants in my yard. It’s very important that when you do harvest seeds, make sure that they are COMPLETELY dried out. That ensures that your seeds are healthy, and won’t be prone to mold if they are not all the way dried out. 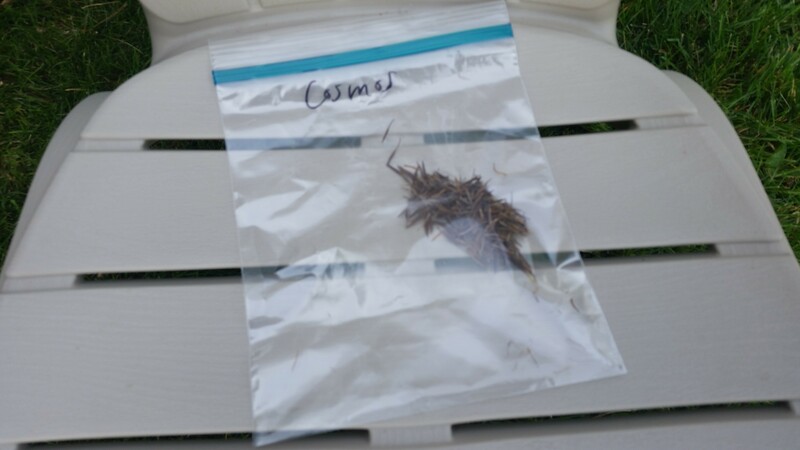 I noticed I pulled off what I thought were dried coneflower seeds to find out that when I put them in the plastic baggy I was storing them in, there was a bit of moisture in the bag. So, I disposed of them and I am now waiting for the other seeds to be completely dried out. 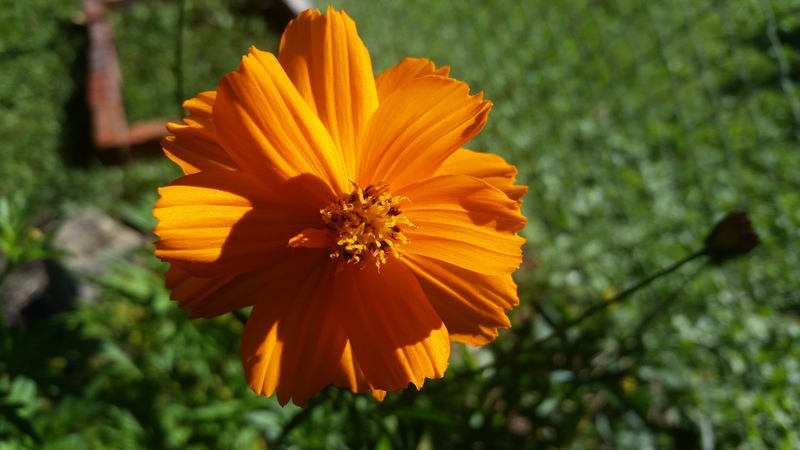 The flower that I have that was the best example of actually demonstrating harvesting seeds is the Cosmos flower. 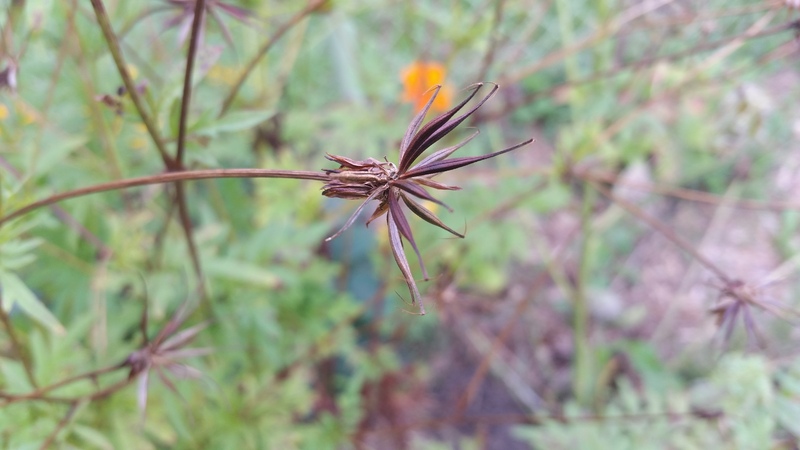 It’s a big, bushy flower that can be perennial or annual, and I am still trying to do my research to find out what exactly my cosmos really is. I simply plucked off the seeds and put them in a small bag. I have mine in a plastic bag for now, but will put them in paper bags once I am done harvesting because paper bags allow the seeds to breathe and not get moldy. I also made my way over the my local nursery and purchased bulbs of some of my favorite spring flowers, the Allium. 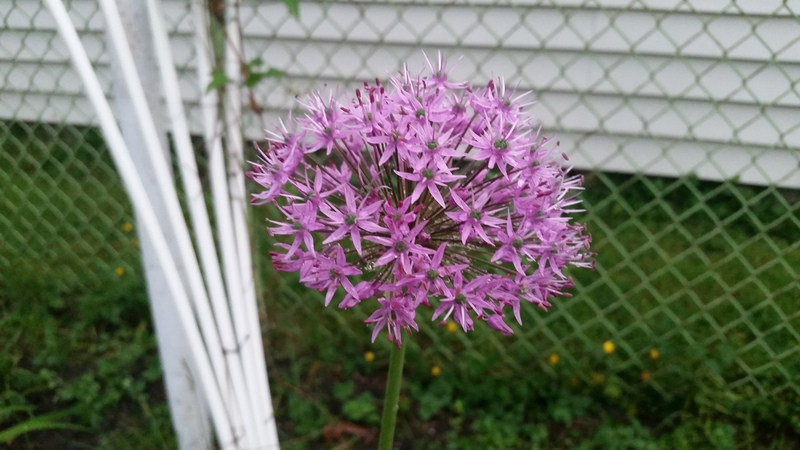 I didn’t plant nearly enough last year, so my fall project this year was to plant many of these spectacular looking flowers that look like puff balls. 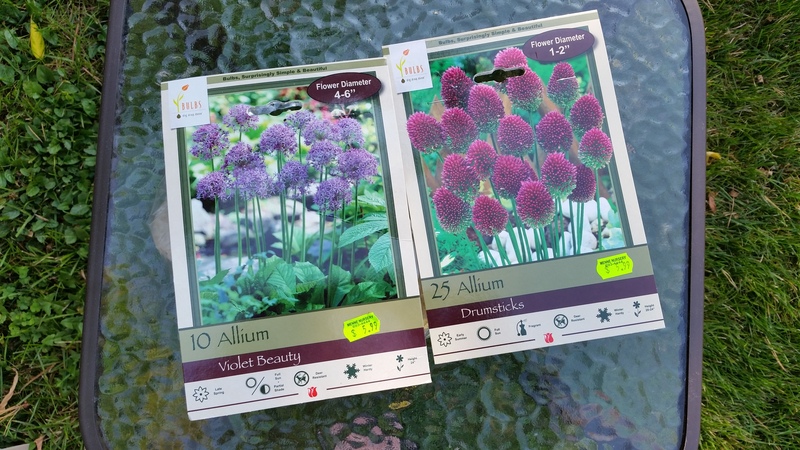 So, much to my delight, I purchased 35 bulbs of two different kinds of Alliums, and I can’t wait to start expanding my garden to add these beauties to it! If you can get 25 bulbs for $5.99, that’s a pretty good deal, and in the long run, it’s much cheaper than buying a plant. Seeds are an even better way of saving money. If you keep harvesting them year after year, you won’t ever have to buy anything again, unless you want something different, of course. With just a little time and money, you will watch your investment “grow” in no time! Yet another week has gone by, and yet again we are just a little over a week away from the Fall season officially kicking in. I don’t know about you, but the transition from Summer to Fall is far more distinct to me than any of the other seasonal changeovers. As ironic as it is, Fall settles in, for some reason, I always think it’s time for me to start thinking of changing things up, setting new goals, starting fresh in life. The can also be said for one’s garden. Another growing season has yet passed, and I am anxious to begin work on next’s year’s garden! You don’t need a lot of tools at first. Trowel– the namesake of this blog. 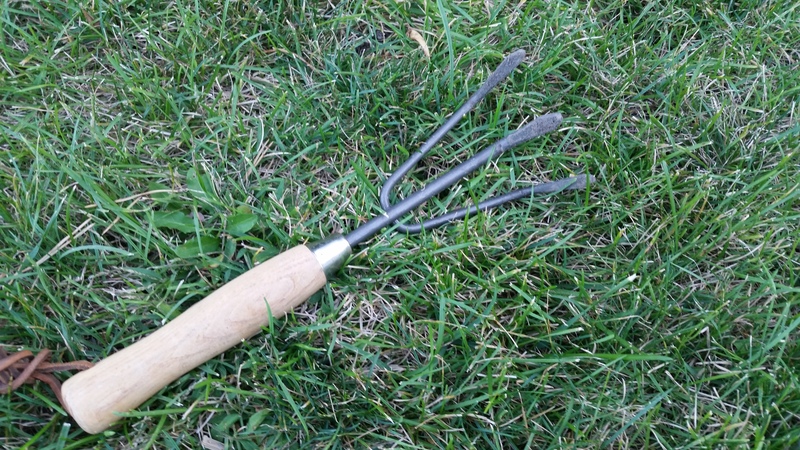 This is a small digging tool that works best when you are putting in flowers or plants in a bed that is already established. I often use the trowel to put any annuals or small perennials I plant. 2. Cultivator– is yet another hand tool with three prongs that is used to loosen the earth if the soil you are intending on planting in needs to to turned up to allow for planting. Cultivators come in many sizes, but the hand cultivator is the best suitable for small planting bed jobs. 3. 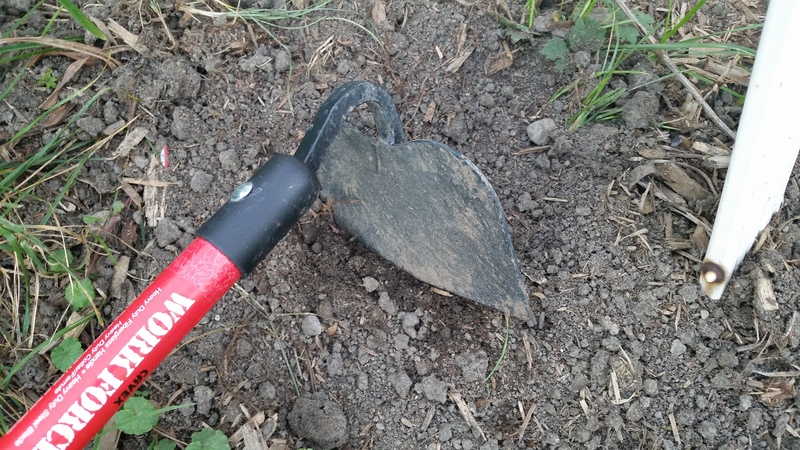 Garden Hoe– a larger, but bigger cultivating tool that allows you to turn up the soil in your flowers beds that is used to get rid of any stray weeds that might be making their way into the garden. Very simple, and has been used for centuries as a type of cultivator. And, if you are like me, you also like to make new beds, so digging into a part of your yard “cold turkey” calls for something much bigger and sturdier to get the job done. And of course, that is your basic shovel. Shovels are great for planting small trees, woody shrubs, and just planting anything in a place in your yard that has not been turned up and prepared for planting. If you plan on doing some major landscaping, I recommend getting a tiller— which is more or less a gas powered cultivator that can turn up a vast amount of area in a relatively small amount of time. Small versions of a tiller start at around $250. But usually you are well into being an established gardener when you decide to purchase one of these. You can also rent one if you don’t have that type of cash to spend on lawn equipment. It may take a few growing seasons before you understand the reasoning behind transplanting. Maybe the garden you started has a few things that aren’t growing to their fullest potential in one area, so you are going to try another spot to see if they do better. Or, you are focusing on garden aesthetics and realize that you don’t like your clematis right next to a new lilac. These are just a few examples of what transplanting can do. Transplanting transforms the look of your landscape, and is important in creating harmony for you and your growing space. Introduction, and why ” The Bent Trowel”? My name is Wendy, a gardener for six years, who lives in Western New York. I have always been active and love the outdoors. Gardening for me is really just another activity that keeps me outside! Growing up in rural Western New York, my whole family were outdoor enthusiasts. My dad hunted, and both of my parents drove snow machines. My sister, brother and myself were encouraged to go outside all the time. My backyard was 40+ acres of woods and hay fields. We rarely watched TV. We only had three channels! My parents were also huge gardeners. They have both flower and vegetable gardens, and I watched them work and tend to these gardens for years. Unfortunately, I don’t live in the country anymore, but I do live in a northern suburb of Buffalo, NY, that’s literally a stone’s throw away from the historic Erie Canal. 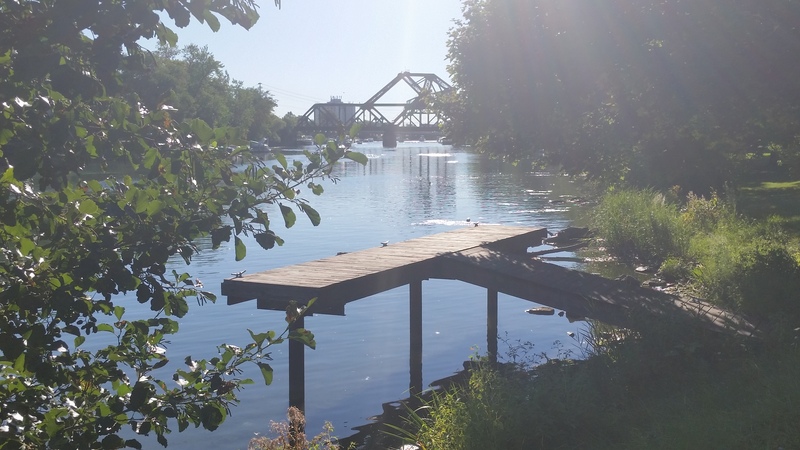 This is quite a beautiful area, especially in the summer. Unfortunately, our growing season is rather short, but we Western New Yorkers make the most of the time we have, and we appreciate every minute! 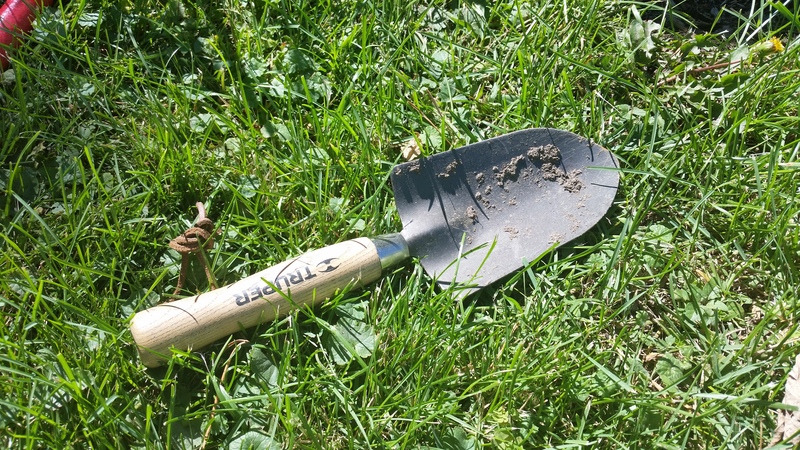 The “bent trowel” is what happens when you unknowingly purchase super cheap garden tools from a discount store, trying to tackle your first big job of landscaping your new home! That was also one of the first lessons I learned– invest in a good set of gardening tools– it’s worth the money and will save you time and will eliminate many headaches in the future! I have since “grown” from that experience, and it has only gotten better. Once you are bitten by the gardening bug, it really becomes addicting! The joy I get out of making the yard space I have beautiful by planting, digging, transplanting, and expanding (when this happens, you know you have been bitten by the garden bug! ), is truly indescribable. Gardening is hard work. Period. The time and money you put into it can seem daunting, so that’s why I would like to share with you my journey, and what I learn along the way. You can make your outdoor space look like a million bucks without spending that much. As with everything in life, you start small, and go from there. You may hate it after trying it. And that’s OK. At least you tried. Or, you will be like me and end up loving it, and want to spend every minute trying to figure out what to do with this corner of the yard, or that shady space under the tree. So sit back, and enjoy. Hopefully, the information I have supplied to you will help you out with your future garden endeavors! Annuals– plants that only last one growing season. Perennials– plants that come back year after year. So, you would like to start gardening. How do you start a garden on a budget? Buy on sale. Wait to buy most of your plants after the season. Small farm stores, big box stores and nurseries start slashing prices by 50% on their “spring nursery stock”, which includes trees, shrubs and other perennials. Stocking up in August and into the fall is the smartest and less painful on your wallet. Buy seeds and bulbs. Seeds and bulbs are much less expensive than actually buying the plant. Of course, you will have to invest a little more patience waiting for seeds or bulbs, but that still costs less overall! I recommend purchasing seeds from your local nursery or farm store. I do not recommend buying seeds from a big box store. I know this from experience from this past growing season. Thinking I could get a great deal on a bag full of seeds and bulbs, NONE of them came up. Yet another “growing” experience! Get them free. Relatives, neighbors, friends, even plant exchanges at your local garden club, are always willing to give you plants that they have too much of. Trust me, this will happen. You will get plants that will start growing like crazy, and instead of just pulling them out of your garden, you can share them with those closest to you! Please stay tuned as I lay down the groundwork on the basics of gardening and take you right into the fall season!